Hogan’s time has come and gone. Time for him to move along. I suspect bb is bringing in at least one free agent wr and drafting one or two as well. A player is only really open, for game purposes, when the player is open on time and on route. People screaming "OMG! QB missed that wide open dude!" when the wide open dude was #4 in the progression and the QB was reading the opposite side of the field when the wide open dude got wide open, or the player was the #1 in the progression but didn't clear before the QB had to turn elsewhere, are wasting their time on an irrelevancy. This is, in fact, one of the reasons I've tried not to read too much into things when I've questioned the 'why' of Dorsett not getting more attention, when we've seen him break 'open' on occasions, only to see the throw head in a different direction. Was Hogan getting open a ****load of the time, and just being ignored? Possibly, but not likely. That would run counter to the team's offensive philosophy. I agree, but my pipedream is a receiving corps of Edelman, Hogan, Amendola, Gordon and Patterson for next year. I know it's a long shot, but all for the right price of course. So, aside from Edelman, we’d have a couple of mediocre has-beens/depth options, a player who hopes to overcome the disease known as addiction, and a special teams player who is good for kickoff returns and some jet sweeps, but can’t produce in the downfield game worth a damn. Josh Gordon could fall into one of these categories, assuming he can stay clean and on the right path. Patterson stays as a ST player if the cost is right, but in a perfect world we’d address the receiving options well enough to where he’d only count as a WR5. He is a good number 4 receiver who has been forced to be the number 2 - no fault of his own. You list 5 positions and then say that Paterson as #5. I agree with your analysis. The roster needs 4 WR's, not counting Patterson who is fine as the #5. And yes, I am fine with Edelman as one of the positions, and Hogan/Amendola/Dorsett as a second. We need 2 more receivers that are expected to be contributors and capable of "starting", depending on game plan. Wrong, the reason we won that game is the defense, which held mahomes and that chiefs offense almost scoreless the whole 1st half. Heck, that defense is the reason we won all 3 playoff games. Rarely does a single play wins you a game... e.g. a Hail Mary with 2 seconds on the clock. As great as the defense was, it wasn’t the only reason they won all 3 playoff games. Certainly a big part but Michel ran all over San Diego, Brady and the offense scored those points to win over KC. Also, the Rams defense was fantastic, not as good as how the Pats played, but lethal in it’s own right. Brady and the offense had to overcome that to seal the deal for his defense. Team sport all the way. Just re-watched the AFCCG...some folks are over-the-top here against Hogan. He came up pretty big in that game. I think the reason he and Dorsett were invisible in the Superbowl had a lot to do with Aaron Donald and Suh - the Pats knew that Brady shouldn't hold the ball against the Rams DL, and he wasn't going to be able to step up as much, as against teams that do more pressure from the outside. So Brady was going to reads 1 or 2 (Edelman or Gronk or one of the backs), and why not? You can see how great Gronk was on that deep pass in the 4th. He was covered when the air was in the air against fast Dbs but ended up with separation when the ball got to him. 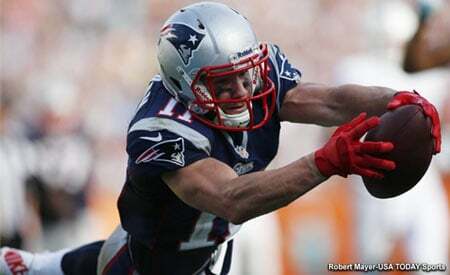 Edelman just gets open. Hogan couldn’t do either last week. We need improvement at this wr spot so our offense is less predictable. In Hogan's defense, he was open in a few games and Brady didn't throw to him. One if I recall correctly was for a TD but Brady missed someone else. I disagree with C. Patterson being “fine” as a 5th receiver. He’s an explosive player on kick returns, sweeps and receiver screens, but, in no way, did he demonstrate an ability to be a consistent receiver within the normal offense. The Patriots need receivers who can beat man coverage and make plays outside the hash marks or downfield. C. Patterson can’t run routes well enough to do that. To me, the Patriots need to upgrade WRs 2 through 4 this offseason, so they need to bring in 1 or 2 outside receivers depending on Josh Gordon’s availability as well as a backup slot receiver to share the load with Edelman. I’d rather the 5th receiver provide depth as a receiver rather than be an offensive novelty like Patterson. Phil Dorsett would be a much better 5th receiver than Patterson because he can, at least, run the routes inside and outside allowing the offense to stay in their normal offense when they have an injury or two. CP went 21 for 247 this year as our 5th WR. So Patterson puts up numbers that are more than 40% higher production than our best 5th WR had in the last 6 years. Add to the fact he seems to be a decent fill-in RB (5.4 avg in 227 yards) and is an elite KR guy and you dont think he is "fine" as a 5th WR? Once again, simple facts disagree with you. Sure, but to claims that a single catch by Hogan is the reason we were in the Superbowl? Not even close. As far as stats, Patterson performs like our 4th WR. As I have said for years, the #4 and #5 receivers have very few receptions. Their primary importance is injury insurance. The #4 WR could be important when we don't have a TE that is among the top targets. But, we are discussing #5. I believe that the #5 has even fewer when you go back more in years. Without looking can anyone tell me who the 5th wr was on the 2007 teams who recorded catches ?